Have you seen an RVs going down the road with its TV antennas up or an electrical cord dragging behind? When we travel, we have some problems keeping things in place. Some of the dishes bounce around in the cupboard and a few broke. When I opened the fridge door, the milk fell out and spilled all over the floor. Finally, the awning almost unravelled. Do you have any suggestion on how to keep things in place? Keeping things in place or even remembering to secure everything when you are moving can be a real challenge. How many of us have seen RVs going down the road with their TV antennas up or the electrical cord dragging on behind? Or have you opened a cupboard door, only to have something hit your foot? Trailers tend to bounce around more than motorhomes, but no matter what the RV, remember they are constantly twisting and bouncing as they go down the road. Over the years, we have picked up a few hints to help avert possible spills and damage. Keeping the awning safe. 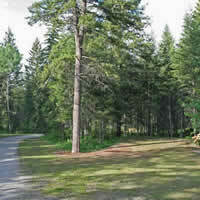 There are special awning tube locks that stop the awning from unravelling when the RV is moving. Fred made one using springs and chain. We also use Velcro ties around the awning arms to keep them closed. Reminder disc. We make a reminder disc and attach it to the handle of the TV antenna. We write on it all the things we need to do before we move. Keep things in containers. They come in dozens of sizes, shapes and forms. The important thing is that they fit. Be sure you anchor containers in place so they don't shift around when you're in motion. Make sure the containers are not too big or heavy. Be aware of what you can lift. The last thing you need is to injure your back, legs or arms. Pack tight. A empty shelf or cupboard is better than one with just a few things in it. Fill in the spaces. I know, we seldom have empty spaces. But when we do, we fill in the blanks with such things as towels and pillows. Pillows work well to fill in spaces and protect the glasses, cups and plates in the cupboards. The microwave becomes a wonderful place to store towels, especially paper towels. This also protects that costly glass plate from popping out and breaking when you open the door. The oven holds larger pans, wrapped in towels to keep them from rattling around. Fred has built a sliding barrier to keep our cupboard doors closed. Check out the locks used for childproofing cupboard doors. Cushion breakables. Cushioning prevents annoying noises (especially in motorhomes) as well as protecting breakables. Paper plates between pots, pans and regular plates works well to keep them from clattering. Last year, I forgot facecloths and found this incredible deal, so I invested and ended up with more facecloths than we would ever use. They became cushions between the bowls and worked well. A friend suggested putting the wine bottles in socks to keep them safe as you bounce down the road. If nothing else is available, bubble wrap is fun! The kettle goes into the sink when we travel and a paper plate goes under the kettle to protect the sink. Make sure there is enough weight in the kettle to keep it in place. Keep things close to the floor—that way, they won’t have as far to fall. 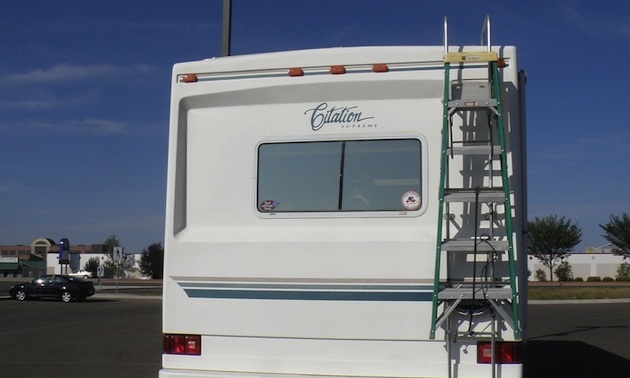 As with many other RVers, our portable ladder is mounted onto the RV ladder. We found a bike carrier that fits and then use bungee cords to secure it. We met some folks in Saint John, New Brunswick, who suggested that if we were going to Maine, we had to see Acadia National Park. We then had our next target destination. We set up overlooking the Virgin River and our view was of an incredible red-streaked rock formation interspersed with cactus and desert brush.